Houndmouth is one of those bands for which the songs seem to play themselves, minus fanfare or any particular direction. That’s an illusion, of course. The melodies and the storylines rise above the sloppy musicianship and the thrift-store look, and you come to realize that you are in the grips of a red-blooded groove, unmistakable, and inexorable in its own way. The band is from a place in Indiana called New Albany. There are four in the band. Call what they do Americana, folk rock, or roots — whatever. 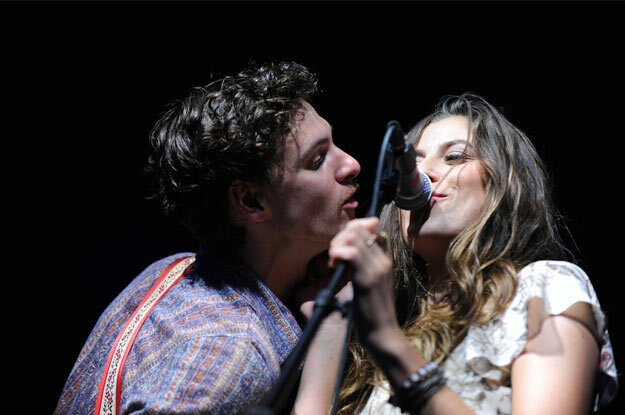 And if Houndmouth rings that same bell that the Band used to, well, so be it. We haven’t heard that manner of loose-jointed rock in a long while in a mix of songs that illuminate the kind of hard luck that authors E. Annie Proulx or Flannery O’Connor wrestled with inside of their own stories. Otherwise, Houndmouth’s own luck has been right on time. They’ve not been around very long, but already they’ve been spotlighted on all the hipster late-night TV shows. Every new band should be so lucky, eh? Some of the band members were friends as far back as high school, and they made music back then, which explains why they sound tight, as if they were related. The songwriters in the quartet have admitted to having no real plan, but instead follow whatever melodies arrive on the winds of band practice sessions. Friday, November 13, 2015, 8 p.m.
Houndmouth’s early efforts became known via America’s new virtual nightclub scene — the pop blogosphere, which generated early success online that allowed them to skip a lot of traditional roadwork. But clubbing was the only route available to their forebears and, as such, road audiences are the grist that shapes any group’s music. Yeah, Houndmouth is great now, but I look forward to hearing them after a few years down the line, after they’ve gotten some more gigging under their belts.